There’s simple food and there’s simplified food. However I don’t believe in simplifying simple food, if you get what I mean. Take for instance a “simple” bowl of shrimp wanton noodles. Conventional wisdom tells us base ingredients for this should include some egg noodles, some shrimp wanton and broth. But putting all these together doesn’t automatically make a great bowl of soup. Oftentimes the samples I’d get come with overcooked dumplings or the noodles all clumped up in a gluey mass or the broth tastes of salt or various combinations thereof. Enter now this noodle house I often go to when in Hong Kong. I never really figured out the name since I can’t really read Cantonese but whenever I get a hankering for some good shrimp wanton, I come to this place along Hanoi Road. This diner type establishment doesn’t really have a menu because all it serves is either wanton, fish ball or beef noodle soup. A side vegetable or two and some soda but nonetheless the spartan kitchen in front only contains vats of steaming broth and big bowls of dumplings ready to be served out. This visit, I come in at a relatively odd hour of 3pm for a very late lunch but I knew the place would still be filled with people. I was correct. I ordered some shrimp wanton noodles and a side order of veg by pointing at the signs out front. Two minutes later the old waitress plonks the broccoli in front of me. It was noticeably fresh, steamed or blanched but still had that substantial crunch. The oyster sauce itself had a different smoky, meaty taste. Another two minutes passed when the old waitress then plonked the soup on the table. I’ve tried the beef and fishball noodles in this place and not to say that they’re not good, but they just don’t compare to the shrimp wanton for me. A typical serving consists of four golf ball sized dumplings mounted on some egg noodles. The dumplings are cooked to perfection; with large pieces of plump, sweet prawn that snap when bitten into. The egg noodles are literally only blanched for a few seconds in hot broth leaving it with this nice springy texture. And there’s pretty good separation which makes slurping enjoyable. The clear soup was rich but did not overpower the delicate flavor of the wantons. With some chili sauce, this proved to be some seriously good eats. I naturally tend to gravitate towards these specialized restaurants in that they do only a handful of dishes or even just a specific type of food therefore giving them more time to do them well. I suppose anybody could make these wanton noodles if they wanted to but experience, knowledge (probably passed down from generations) and skill of doing it everyday would probably not be on their side. This wanton noodle joint, or more accurately, noodle joints in general that don’t cut corners such as this wanton noodle joint has ruined me. Forever. In that I can’t go back to eating clumped up egg noodle soup ever again. Mmm...just reading your description of the shrimp wanton noodle soup made me yearn for that authentic, no-frills taste. It also just makes me guilty that I only ate instant chicken noodle soup tonight. many people underestimate the effort that goes into making dumplings - whether it's for wanton soup or dimsum. 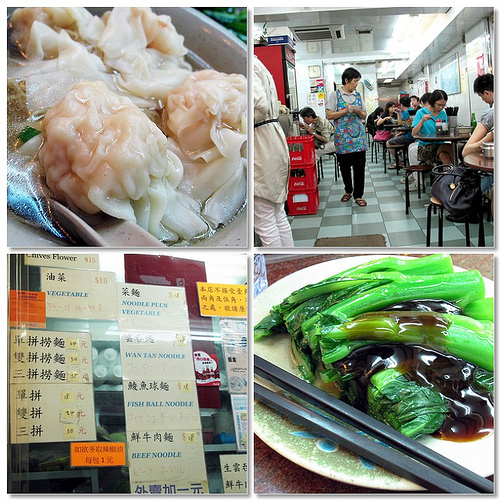 one place you might like to try to is Tsim Chai Kee. they have branches on Queen's Road Central and on Wellington St, Hong Kong Island side. the noodles only cost HKD16, and they come with three wanton dumplings, and your choice of noodles (hong kong mee - what we call hong kong noodles - or flat rice noodles, hor fan/hofan as we know them). there is dried flounder powder in the broth, there is a little dried shrimp. the fresh shrimp in the wanton dumpling is plumped up by dipping the shrimp in a lye solution - but not for long. so i would say: not so simple, but delicious nonetheless. cheers. your blog is wonderful. I never fail to dine in this hole in the wall resto whenever i'm in hong kong. It's very near the kcr station going to hung hom. The size of the shrimp wonton has actually shrinked a little as compared to last year's. Dip the shrimp wonton in chili sauce and red vinegar, the taste is a blast. Another favorite of mine is the beef noodle soup. They actually use raw beef and dip it quickly in hot boiling water. I usually pair this with "hofan", white flat noodles. Sarap. Take note, all servers are senior citizens.